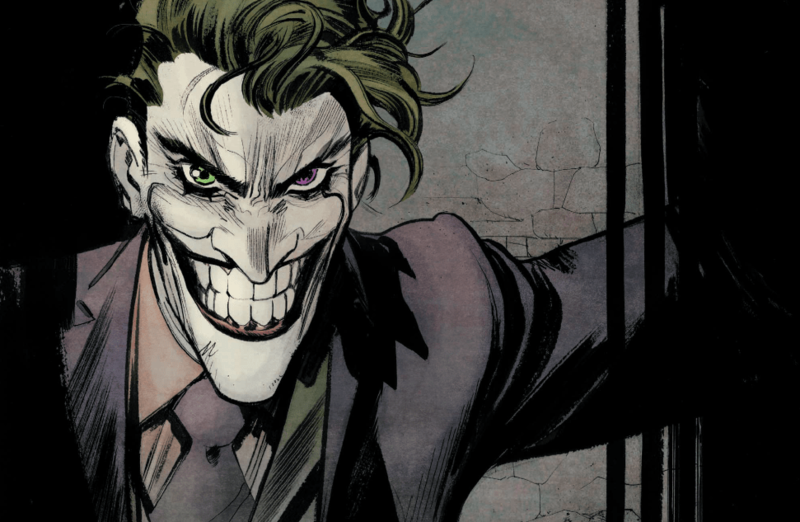 Batman: White Knight #7 Review – AiPT! Can Joker team up with Batman? It was revealed at the end of last issue Jack Napier may not have full control over the Joker anymore. We even featured this awesome panel in our Monthly POP and it does a good job changing everything as we lead into today’s penultimate issue. Sean Murphy has been writing and drawing this gem of a series with a main thesis coming to fruition in this final chapter. What’s the thesis? That Joker loves Batman and Batman loves joker, of course. This issue, it’s Jack versus the Joker! Napier’s identity crisis spins out of control and compromises his grand plans for Gotham City–but not before he strikes a fateful bargain with Neo Joker. A browbeaten Batman accepts a peace offering from Batgirl, and some unexpected advice from Alfred sets the tone for the GTO’s new mission to redeem the city. Murphy is telling an alternate reality story about Joker and Batman, so it may not be in canon, but it certainly relays interesting ideas about these characters. One of the coolest involves Harley Quinn — in this universe, there are two of her! One is like the cartoon and the other like the movie and Murphy has a tantalizing explanation for this, which ends up being the driving force behind Neo Joker. Penultimate issues tend to be duds because the creators lean into setting up the final issue rather than give an entertaining story in its own right. Not so here, as Murphy unveils two major reveals that help build the Batman/Joker relationship as well as explain some of the major issues I had with the series so far. The series has done a good job establishing what Batman would be like in the real world and that includes all the property damage that comes with taking down supervillains. Batman has been reckless from the very start of this series which has certainly been frustrating, but Murphy makes it clear Napier has been reckless too. It was right there under my nose the whole time, but Murphy is drawing a clear parallel between the characters, further proving they are one in the same in many ways. The story does do a lot to build up for the finish, essentially getting Batman back in the field and Joker/Napier ready for some team-up action. Tucked into this setup is an awesome reveal involving Jason Todd. The way Murphy handles Joker’s explanation for why he beat Todd nearly to death is satisfying and further layers his main thesis. Murphy’s art hasn’t skipped a beat and this issue might be one of his best yet. That’s in part because we actually get to see Joker (who transformed into Napier in issue #1). There are a lot of beautiful Gotham vistas explored and the Jason Todd reveal utilizes a nightmare-like visage of the Joker that’s unnerving. Matt Hollingsworth does well to let Murphy’s lines shine as he adds a subdued pop to the panels and pages. Batman’s abiltiy to escape prison did cross my mind in the last issue and it’s explained well here. Nearly every issue before this one aimed to prove Batman needed to be put behind bars. That makes it a tad strange that he’s barely behind them at all in this issue. His release is there suit the plot rather than actually making that much sense at all, with Commissioner Gordon sort of just rolling with Joker’s plan. There are times when comic books need to pivot to get to the good stuff and this issue does that pretty heavily with Batman’s incarceration. A satisfying penultimate issue that’s must-buy for fans of The Joker and Batman. Murphy has shown he has a unique perspective on the Batman mythos and each issue further proves its worth. A solid penultimate issue that keeps your interest while setting up the finale.